This image captures the rugged SEAL’s profile and an artist’s conception of the ship in action in a future battle. (MC2 Kevin S. O’Brien, U.S. Navy photograph Navy NewsStand). 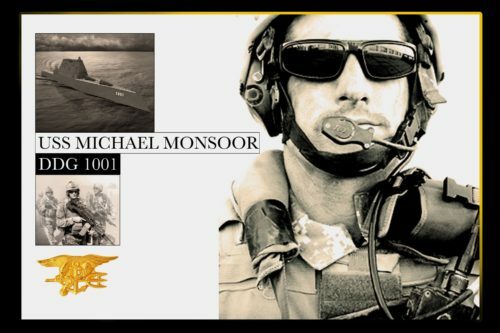 SAN DIEGO–The Navy will commission its newest destroyer, USS Michael Monsoor (DDG 1001), this Saturday at a ceremony at Naval Air Station North Island in San Diego where the ship will be homeported.